"Are Baby Boomers the face of the innovative startup of the future?" This is a great overview posted yesterday by Dominic Basulto at the Washington Post. There are many great reasons boomers have to launch their own enterprise. This article supports those opportunities. Of special significance is the idea that boomers will lead in the creation of new enterprises focusing on good health. Food enterprises should be considered as the leading edge in the business category of good health. Keeping us healthy through good food is far more valuable and less expensive than medicines, surgery and biotechnology. This opportunity will last for decades. Food entrepreneurship through our Innovation Kitchen model is making a significant contribution to this discussion. Opportunities for boomer innovation and entrepreneurship are everywhere. Don't slow down. Accelerate. Washington Post - "Why Baby Boomers are the innovators of the future" by Dominic Basulto. Original quotes and graphic are copyright the Washington Post. Thank you. We're in the midst of an opportunity to grow businesses, entrepreneurship and good jobs through food. The Innovation Kitchen model was highlighted along with other great projects at our Milwaukee (M7) Food and Beverage Advisory Board meeting on Tuesday. Right after the M7 FaB meeting, I got the chance to meet with a great new friend working on economic development in inner city Milwaukee. There is so much opportunity for rural and urban regions to collaborate on job creation through food entrepreneurship. This could be fun. And (drumroll...) our Iowa County Board approved a loan package that will help open a USDA inspected poultry processing facility in our beautiful Highland, Wisconsin. They will be able to process emu too. What fun. This has been a project my economic development org has been involved with from the start. Congratulations Midwest Poultry and Ratite! Congratulations Highland! New presentation: I was honored by an invitation this week to speak at the Illinois Farm Bureau's Local Food Connections and Technical Summit in early August in Bloomington. My presentation will focus on strategies for developing and integrating local food processing opportunities across the region. New friends: I also had a chance later in the week to visit the Michael Fields Institute in East Troy, WI and got to meet with David Andrews, Executive Director. The Michael Fields Institute's mission is to "cultivate the ecological, social, economic, and spiritual vitality of food and farming systems through education, research, policy and market development." Great visit. I'm looking forward to learning more. A great week for local food processing initiatives and meeting new friends! FaB Milwaukee. 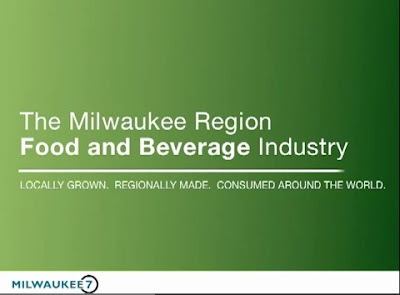 The Milwaukee 7 Food and Beverage Industry Network. Highland - in beautiful Iowa County, Wisconsin. I agree!. To order your own Raw Dog Relish call the Wisconsin Innovation Kitchen at 608 987 3558. What 3 questions would you ask a community interested in economic development? My friend Laura Brown is the Community Development Specialist at the Center for Community & Economic Development at our University of Wisconsin Cooperative Extension. She posed a question over on LinkedIn to the economic development professionals group that got me wondering. She asked: "If you could ask three questions to find out if a community is ready for economic development what would they be?" Is there a will to focus on creating new customers for your community? Is there a will to invest the time (3-5 years) and budget to create a culture of entrepreneurship in your community? Will you agree that whatever strategy is adopted, access to the tools and benefits of economic development should be available to the widest number of people in your community? Without a 'yes' to all 3, you don't have many sustainable options. 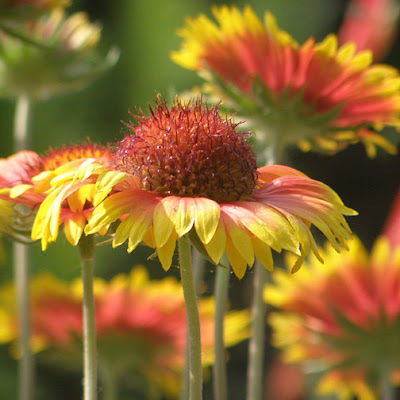 Photo taken our Olbrich Gardens, late May. Our Milwaukee region, and our state of Wisconsin, are globally relevant leaders in the world of safe, sustainable food processing. We have global A-Game talent. We have the human networks and the physical infrastructure in place. We have an amazingly diverse agricultural capacity to grow, process and distribute an abundance of great foods. Perhaps most important, we have the water resources, as well as the water science and engineering expertise in Wisconsin to make it all sustainable. "We truly have a wealth of companies in this industry, in this region," Jurewicz said. "Everyone from growers, makers, bakers, brewers, bottlers, educators, scientists, farmers, distributors, grocers and restaurateurs bring something to the table." "There are currently 243 food and beverage manufacturers located in the seven-county Milwaukee region, employing 14,700 people. Seven of the world's 11 largest food manufacturers have a presence in the region, and Wisconsin has the greatest concentration of food industry workers in the nation." Wisconsin is a world leader in food based economic development. It's also a tremendous place to live and do business in the globally relevant world of safe, wholesome foods. Join us! FaB Milwaukee site. Thanks Shelly and friends! At the Wisconsin Innovation Kitchen I have made many wonderful new friends. Among my favorites are Karen and John, proprietors of The Elegant Vegan, a great new food products company I patronize and support. We write to ask you to vote for The Elegant Vegan by June 30 us to make us eligible for a grant from Mission Small Business. As you may know, we started a vegan food product company about two and a half years ago. We wanted a broader selection of really good foods that we wanted to eat and found that many others shared our desire for tasty, healthy foods. You can get more information about our two food lines, The Elegant Vegan and Vegan Eats ‘N Treats from our two websites: The Elegant Vegan & Vegan Eats 'N Treats. You’ll see that we established a company that has a socially responsible aspect to it as we employ a non-profit owned commercial kitchen that has a licensed kitchen staff and hires people with disabilities to carry out non-technical tasks. We also pledge to donate 2% of our net profits to organizations that promote social justice. You’ll see what people say about our products and you’ll also see photos and descriptions of some of our products. What you won’t see is that in a short period of time we’ve captured the interest of Whole Foods Markets in Madison, Milwaukee, Evanston, and Chicago, the Outpost in Wauwatosa, Wisconsin, A Natural Harvest and KMT health food stores in Chicago, and Perelandra in Brooklyn, New York, all of which are in the process of placing orders or putting systems in place to order our products. We are poised to grow and are applying for a grant from Mission Small Business that would provide needed resources to support this growth. 1. Go to this link at Mission Small Business.. You will see on the bottom right side of the screen the message: Log in with Facebook to support your community. 2. Click on Log in & Support, where you will need to log on with your Facebook account. 3. Enter The Elegant Vegan into the search box and it will take you to a place where you can vote for us (Maxey Lynn is our parent company and we are based in Wisconsin). We would appreciate it if you would forward this message to members of your network and ask them to vote for us. We need to obtain 250 votes by June 30th. We are really depending on your help as we don’t think we even know 250 people between us! If you have any questions or need more information, please do not hesitate to contact us. Thanks so much! This is a wonderful example of great people, great food and an outstanding small business all coming together to promote social good. Please follow the Mission Small Business link below and vote for my friends Karen and John at The Elegant Vegan. Best of luck friends! While you're at it, check out Karen and John's lovely B&B Ye Olde Manor House in beautiful Elkhorn, WI. 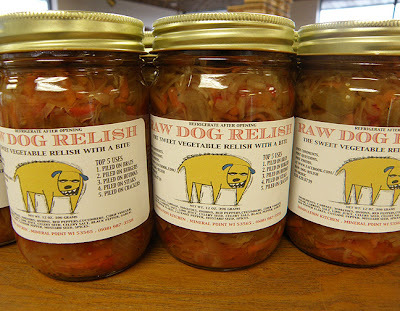 Photo is of one of my favorites from The Elegant Vegan, Sweetly Pickled Radishes. 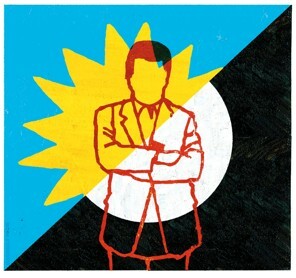 "What can I do to create great economic energy, to bring new customers...?" 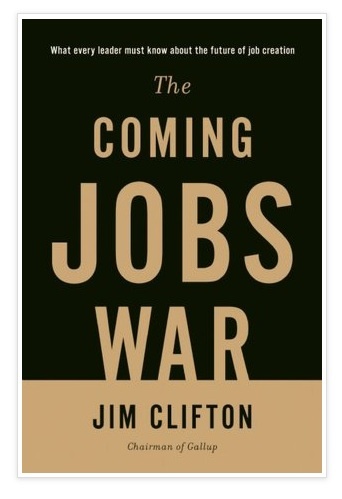 Some final noes from The Coming Jobs War by Jim Clifton, Chairman of Gallup. In an earlier post I especially liked this quote: "The investments should follow rare entrepreneurs versus worldwide oversupply of innovation. Put another way, it's far better to invest in entrepreneurial people than in great ideas." "How does a leader create more jobs than the competition?" "By creating more customers. Almost no one knows this. Keep in mind that no business is trying to create jobs. They are all working all day and every weekend to create new customers. New customers are the real goal of a nation. Because jobs always follow customers. Too few leaders have this figured out... "
"Innovation is not scarce. Entrepreneurship is scarce. We are spending billions and wasting years of conversations on innovation and it isn’t paying off. Great business people are more valuable and rarer than great ideas." "America has about six million active businesses. Ninety-nine percent of them are small businesses. An incalculably huge mistake leaders are making now is spending time, money, strategies, and especially policies for those who need “help” getting a job. A useful way to look at any citizen is this, “Can she herself create jobs or does she need a job created for her?” We are spending all our time on the cart and doing little or nothing on the horse." "It is wrong thinking to imagine that Washington has solutions. Job creation is a city problem. There is great variation in job creation by city in the United States. San Francisco and the greater Valley keep pumping away while Detroit isn’t. Austin’s cart works while Albany’s doesn’t. Cities need to look inwardly and say, “What can I do to create great economic energy, to bring new customers for all existing companies and start-ups?" Create more customers... Bring new customers to your region... Rebuild regional economies. Sounds like a plan to me.